Merge 4 DMX 512 universes into 1 with this multi function merger unit. Merge multiple DMX 512 universes into one with this versatile multi function merger with six merge functions to choose from. With two individual circuits installed each can have a different merge type if needed. For example merge two DMX w/ HTP and then append or backup/override the 3rd DMX input. Need to merge 3 universes? 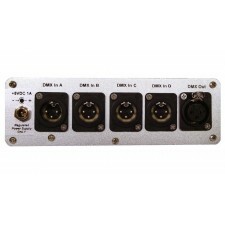 See our DMX Merger 3x1. Need to merger 5 or more universes? See our 1U rackmount enclosure and 2U modular enclosure options. LTPC Latest Takes Precedence / Priority by Channel. The HTP mode will merge two universes into one universe using HTP (Highest Takes Precedence/Priority) processing of the level of each channel. In this mode two lighting boards (or any two DMX 512 generating devices) can control the same devices. This mode is useful for controlling the same DMX 512 equipment and devices with two DMX 512 generating devices in one universe. The Append mode will split the DMX channels into two parts (the size is user programmable) so the 1st DMX source (lighting board or console e.g.) of 128 ch's will be sent normally and the 2nd DMX source will start at channel 129 and up. So both are sent on the same universe but not directly combined or would control the same devices. This mode is useful for controlling different DMX 512 equipment or devices with two DMX 512 generating devices in one universe. The Backup mode will send input A continuously, ignoring input B providing input A is a valid DMX 512 signal. If input A’s signal fails input B will be switched to automatically and sent. The LTP mode (Latest Takes Precedence/Priority by universe) will resend universe A or B to the output depending on the universe input that had the latest level change of +/- 1 on any channel. For example with two lighting boards respectively connected to input A and B, the last lighting board that made any change would take precedence and would control the output until the other lighting board made a change and then that lighting board would take control. Please note that the input sources would need to be stable or digitally controlled, otherwise unwanted switching may occur as any change of +/- 1 would initiate a switch. The LTPC mode (Latest Takes Precedence/Priority by channel) will change an individual channels output to the latest level change (+/- 1) on a channel on A or B's input. For example, if the current level on input A channel 10 is 128 and input B channel 10 changes from 100 to 101 the output on channel 10 will now be 101, and all other channels are unchanged. Please note that the input sources would need to be stable or digitally controlled, otherwise unwanted switching may occur as any change of +/- 1 would initiate a switch. (Lowest Takes Precedence/Priority) responds the same way as the HTP mode described above but instead of the highest level sent on a respective channel the lowest level on A or B of the two sources is sent. DMX Merger Examples: Merge a DMX console with a computer DMX controller, append two DMX consoles' outputs, or backup your show with two DMX generating sources with auto switch over function, as several possibilities. Multiple merger / combiners can be used to merge more than two universes or provide multiple functions. Custom build options available. 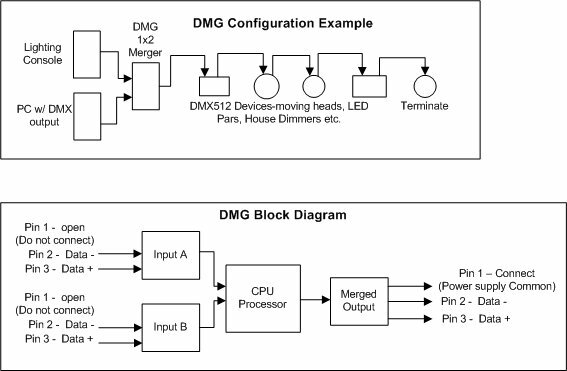 DMG DMX 512 Merger Features and FunctionsNOTE: New modes and PCB dip switches added since video was ..